The NFECs’ Latest Financial Literacy Quiz Measures Three Indicators of Financial Capability. The National Financial Educators Council’s latest financial literacy quiz measures three leading indicators of participants overall financial capability. The National Financial Educators Council’s financial literacy quiz measure three areas that impact participant’s financial capability. The financial literacy quiz allows volunteers and instructors to understand participant’s financial knowledge in three distinct areas that cover ten personal finance topics. The test measures participant’s motivation to learn the subject matter, knowledge of money management topics and the ability to identify the initial steps building their financial foundation. Most common financial literacy quizzes measure only one the participant’s knowledge of personal finance subject matter. This is helpful in providing base line results for pre- and post-testing; however, these quizzed do not measure other key aspects. 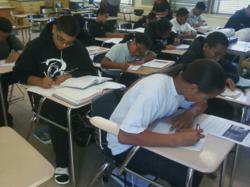 The first area measured by the NFECs’ financial literacy quiz is ‘motivation to learn the subject matter’. An essential element in the NFECs’ financial educator training program shows instructors how uncover and leverage participant’s personal motivation to improve retention rates and desire to learn personal finance topics. Using the Stages of Change Model, NFEC Certified Financial Education Instructors are able use the financial literacy quiz to determine where someone is at in their wiliness to learn. According to the NFEC, ones motivation to learn is important to measure and should directly impact how instructors deliver the material. Subject knowledge is also measured over all ten topics that align with the NFEC’s financial literacy standards. Like other common personal finance tests, this determines their current financial knowledge. This information is valuable when conducting pre- and post-test to quantify improvement in the participant’s knowledge. According to the National Financial Educators Council measuring participant’s ability to recognition the first step to improving their personal finances is important. This helps instructors see if the participants can determine what the most effective initial step to take for participants to improve their finances. The NFEC’s team of educators, financial professionals and personal finance experts noted that most people are unable to identify what they should take initially and consequently many people freeze up. By measuring the three distinct elements that align with the NFEC national financial literacy standards, organizations can quantify the success of their financial education program. Using comprehensive measurements, a money management program can be accurately assessed for overall impact. The NFEC is a global financial education company that is committed to providing resources and training to assist organizations in sharing the message of financial literacy. The NFEC serves all ages and socioeconomic backgrounds of people globally and recently launched their latest financial literacy for students program. The financial literacy quiz is one resource that organizations can use complimentary.